The technology and design elements used to create the Sinn U1 go far beyond standards used at most watch companies. The U1 case is made from the same steel that is also used in the construction of the outer hull of submarines. The steel was procured by Sinn from a steel supplier to Emden GmbH, one of Germanys North Sea shipbuilding yards who construct submarines from the very same steel. This special steel is also amagnetic which means that is does not have magnetic properties and cannot itself become magnetized. The watch movement itself is protected from magnetic fields up to 4,800 A/m. Because of the special steel used from the submarine steel manufacturer, the case resists the effects of exposure to salt water and salt water environments. The uni-directional ratchet operated rotating bezel is also milled from this submarine steel and is Tegimented. The indices are machined directly into the bezel without the use of bezel inserts, which can corrode or come loose at deep depths. The international testing lab of Germanischen Lloyd has tested the U1, and determined that the watch can be certified as water resistant to 1,000 meters. This same firm tests submarines for their ability to withstand the effects of underwater use. Matte black dial with date at 3, Super Luminova on hands and markers, and striking red seconds hand complete the design. Other features include sapphire crystal with anti-reflective coating, and stainless steel bracelet. Verified Owner Comments: Glad I bought it. Verified Owner Comments: This U1 is even better in person. Impressive construction and design. Robust tool watch. Great customer service. Excellent! Verified Owner Comments: Quality engineering and execution at a reasonable price. Verified Owner Comments: Unique diver – great value! Verified Owner Comments: This watch is a 10 out of 10 - you never know the about the quality of a Sinn until you’ve held one in your hands. I have a Tudor Black Bay and the quality is def there in the U1 also. I highly recommend this watch and any other Sinn your thinking about it's well built and you can tell everything was thoroughly thought through. "Great Watch and Excellent Service"
Verified Owner Comments: The Sinn U1 was exactly what I hoped it would be. It is well-built tank of a diving watch. WatchBuys service was excellent as well. I'd buy from them again. Verified Owner Comments: Purchased the Sinn U1. This watch is awesome! I highly recommend this watch to all. The customer service I also great. Thank you. Verified Owner Comments: Watch looks and wears great. Watchbuys customer service is better than Apple! Responsive, helpful and attentive. Verified Owner Comments: Absolutely fantastic watch. Customer service from watchbuys was terrific. A lot is made of the size and the heft of this watch. I have 7 3/4" wrists and muscular forearms, and the watch looks perfectly proportional to my arm, however if you have thinner wrists, and forearms this watch may be a little big. Great Lume, this thing is built like a tank, and gets noticed much more than my Rolex Deepsea. "Sinn U1 and Sinn EZM 7"
"Excellent Customer Service and Watch"
Verified Owner Comments: This was my first experience dealing with Watch Buys and it was nothing short of fantastic! Very knowledgeable and eager to answer my questions making sure I was getting what I expected. Super fast shipping and packaging was A+. The watch itself is everything I was looking for and I was not disappointed in any way. The accuracy is way better than I was expecting and the fit and finish of the piece is amazing. Thank you Watch Buys for taking care of me. Verified Owner Comments: The watch is a Sinn U1 on bracelet. I've had it three weeks now and it is running consistently +7 sec per day which should be easy to regulate down to better than +3 if past experience with this movement is any guide. I really like the watch. It is about the biggest watch I would wear and feels quite heavy compared to the dress/sport watches I've worn in the past, but you get used to it in a day or two. You don't get the precise "click" when rotating the bezel that you get on some other dive watches but it's not loose and it stays put after it's moved. Again, it just takes some getting used to. The watch is tough - I've already managed to bang it around a bit and it is obviously not going to ding easily. I highly recommend the Sinn U1 and Watchbuys. Verified Owner Comments: I couldn't be happier with the design & build quality of this tank of a watch, or with the service I received from WatchBuys. Just an outstanding experience all around, and I look forward to shopping here again soon! Verified Owner Comments: Customer service: Excellent customer service. Watch arrived in a very timely manner. Well packaged. Watch: Flawless craftsmanship. Nicely proportioned. This is a thicker watch compared to prior watches I have owned, but not obscenely so. Still fits nicely under sleeve. Smooth bezel with secure clicks. Position of crown is nice as it doesn't dig into dorsum of hand. Comes with tools for adjusting band. Band is very comfortable and barely notice I'm wearing it throughout the day. The watch is heavy as you would expect. Illumination is subtle, but sufficient. The sapphire, body and band have held up to a beating. Have wacked the face against pipe and brick without any scratches. Has kept perfect time for 3 weeks so far. This could be the last watch I own, but I've already started looking at other Sinn watches. I would highly recommend this watch without reservation. Verified Owner Comments: This U1 makes my Rolex Sub feel cheap and flimsy. It's heavy, yet wears very comfortably. The dial is the most legible and unique of any watch I have owned, and I have owned plenty. It's running +3 seconds a day right out of the box, that's Chronometer standard. WatchBuys even sent it with the time/date set for my home, when I opened it up, all I had to do was put it on! Verified Owner Comments: A close friend has worn this watch daily for almost 5 years. Somehow its understated appearance actually improves with time and the build quality is such that it still looks brand new. I finally took the plunge, and have no regrets. This is a fantastic piece of engineering, both on the bracelet and the silicone strap. And, BTW, if you are buying from Canada, duty is only 5%, and watch arrived within days. Excellent buying experience. Beautiful rugged watch that is meant to be used. "First and last watch for a long while"
Verified Owner Comments: The watch itself is simple yet beautiful. I haven't tracked it yet but it's been keeping very accurate time. It also feels very sturdy I have no fear about knocking the watch around everyday. If you want a timepiece that you can wear everyday and not think about I wouldn't recommend anything else. Verified Owner Comments: Wanted a U1 for several years, very happy! Anyway, the watch was delivered just as described and I am very pleased with it. I was a bit apprehensive about its size being too large for my relatively smaller wrists but it feels and looks smaller on my wrist than I was imagining. The bracelet is great and seems to be very high quality and very sturdy for its price, but I promptly switched it out for a canvas NATO strap. Although I imagine I'll go back and forth between the bracelet and the NATO straps quite frequently. Verified Owner Comments: Great watch. Very tough case. I had 1 problem in Death Valley (USA) it got so hot about 115F that dust from the dial got stuck to the luminescent on the minute hand and has been there since. I would buy one again though, it's a very enjoyable watch. 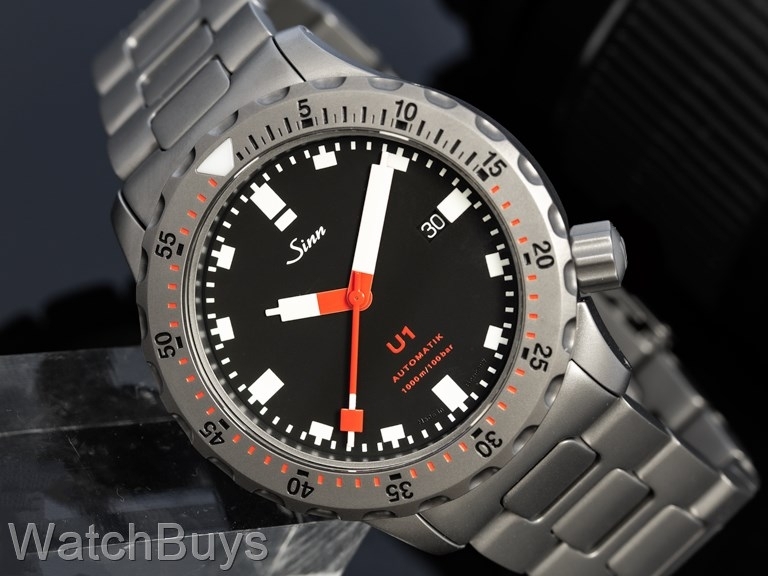 "The Sinn U1 seems Indestructable"
Verified Owner Comments: I would be reluctant to take one of those finely polished highly advertised Swiss products to get banged up among tanks and regulators and such during Scuba, but not so this watch since it really seems bulletproof. It is a heavy watch, and not at all delicate, but for my needs and sensibilities, it seems almost perfect. I have not owned it long enough to fully test its timekeeping abilities, but if a few seconds each day really mattered, I would not be wearing an automatic watch. I am primarily concerned with deep water resistance and the ability to stay intact during rough use and this watch fills the bill. I am quite pleased with it. "Great watch! - as advertised"
Verified Owner Comments: The U1's simple appearance wears well with jeans or business casual and is a great diver for its intended purpose. Though big and robust, it doesn't feel heavy on the wrist. The submarine steel looks better in person than on print. Verified Owner Comments: Received my U1 today. It is better in person than it shows on the site. The quality is readily evident; in fact, each of the Sinn watches I have ordered from WatchBuys are of the highest quality. In addition, the customer service at WatchBuys for each order has been stellar. Verified Owner Comments: This has to be one my favorite watches to wear on a daily basis. Built like a tank and shows no signs of wear. I also just ordered a Sinn U212 SDR!!! Cant wait!!! Verified Owner Comments: The photos of this watch don't do it justice. I love the simple uncluttered dial, very easy to read, and functional as a dive watch and a non-flashy dress watch. Verified Owner Comments: Fantastic looking watch with a great build. It's also very accurate, all I can say is buy one!! "Sinn U1: Well worth the money!" Verified Owner Comments: This is a very distinct and well built piece. I've had it for a couple of weeks now and it hasn't left my wrist. I love how resizing the bracelet is a piece of cake. This watch is a definite keeper and I know it will last a lifetime. Verified Owner Comments: For me, the U1 was love at first sight. I had heard and read great things about the watch and decided to treat myself to one. I really like the watch and the great customer service at WatchBuys! Verified Owner Comments: I had been looking at this watch for quite some time and finally made the decision to purchase. Actually it was a X-mas gift from my wife. Anyway, definitely everything that I had researched was true and I couldn't be happier. I'm very glad that I purchased it on the bracelet because I find it much more comfortable than the rubber strap. It's only about 2 weeks old but so far so good and no complaints. "Loving my new Sinn U1"
Verified Owner Comments: Everything about this watch is better than expected. Adjusting the bracelet is a "Piece of Cake"as well as changing to the strap(thanks to the drilled lugs). The manual is as informative as it is well written and the supplied tools are more than adequate. I'm looking forward to many years with this watch. Verified Owner Comments: This watch is built to last and has a distinct design! It's now my favorite watch to wear casually and formally. I get more compliments on the Sinn than any other, accurate as a certified chrono, and seemingly indestructible. Build and quality equal or exceeds time pieces costing 4 times the U1 cost. Verified Owner Comments: Awesome piece of engineering. A diver's watch distinguished from the rest of the pack. Beautifully handcrafted, solid, unique design, great feel and look. Verified Owner Comments: A must owned time piece..captured by its solid build n unique markers. "My comments on Sinn U1"
Purchased as retirement gift for my husband and it's worth every penny. This timepiece is built like a tank as he states and he likes this watch and wears it more than his Rolex Seadweller and for a watch this size he states its very easy to wear on his wrist. Don't hesitate and don't wait and miss out on this timepiece & for WatchBuys they're the BEST !!! Verified Owner Comments: Well worth the wait. This timepiece is built like a tank and takes all the abuse you can give it. Runs as accurate or better that any of my Omegas or Breitlings. Best bang for your buck in luxury timepieces. This is a watch you depend on to look great with an Armani suit or a Body Glove wetsuit!